Saying that pregnant women carry a "multiple burden," lawmakers from both the Senate and House of Representatives close ranks to push for the passage of a bill that seeks to double the paid maternity leave of working women. "The physical demand of pregnancy alone is challenging. A nine-month pregnant woman carries an average weight of 15 kilos. This is as heavy as a regular hollow block or mid-size microwave oven. Yet, this is but a small fraction of the multiple burden of pregnancy,"Hontiveros said. "The mental and economic challenges of pregnancy are also daunting. The existing maternity law doesn't give enough paid maternity leave for working mothers to fully recover from childbirth, properly care for their child and establish a stronger mother-child bond through breastfeeding. An expanded maternity leave bill does not mean a vacation for mothers. We want women to have the chance to take care of their children and their health and well-being without worrying about the economic costs of being away from employment," Hontiveros added. For her part, Lai called on Congress to reciprocate the action of the Senate in passing its version of the Expanded Maternity Leave bill. She said that the country's alarming statistics on child malnutrition are the result of a lack of a progressive maternity Leave policy. Citing a study by the United Nations Children’s Emergency Fund (UNICEF) in 2011, Lai explained that 65.4% or 4.3 million of Filipino children are suffering from long-term chronic malnutrition. Malnutrition was also blamed for about one-third of deaths of children below five years of age. "The number of paid maternity leave days granted to working women are not enough for their new-born children to be properly fed. Thus, nursing mothers who need to return to work are often forced to stop breastfeeding and shift to infant formula. Two-thirds of deaths among malnourished children are associated with inappropriate feeding practices,” Lai explained. 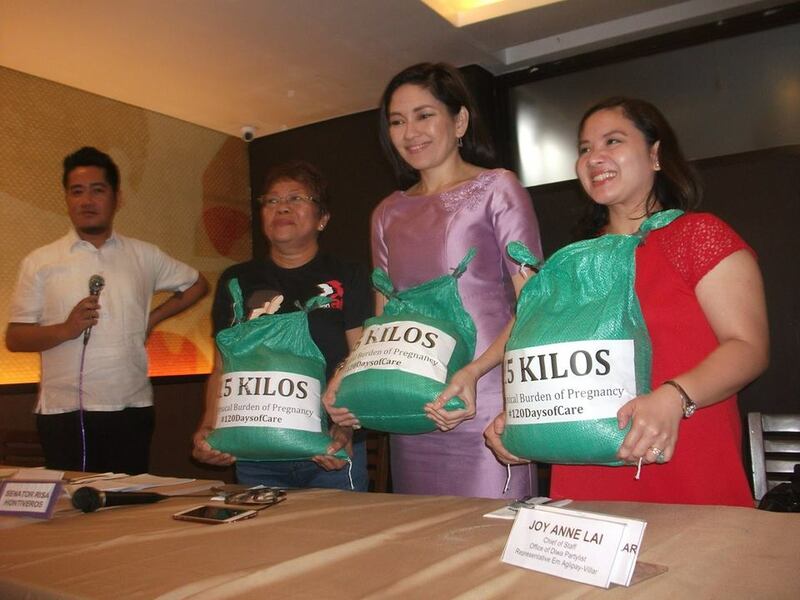 To dramatize the "physical and multiple burdens" of pregnancy, Hontiveros presented bags of sand and hollow blocks weighing 15 kilos each. She asked members of the media to lift them in order for them to temporarily experience the physical challenges of pregnancy. Last week, the Senate passed the Expanded Maternity Leave Law of 2017 granting all female workers, regardless of civil status or legitimacy of her child, 120 days maternity leave with pay and an option to extend it for another 30 days without pay. 30 days can also be allotted to fathers and alternate caregivers.